The HU-16 Albatross is an amphibian aircraft, meaning that it has a planing hull so it can land and float on water, plus retractable wheels so it can land on paved runways. It was used extensively by the US Coast Guard, Air Force, and Navy for transport, air/sea search and rescue, and many other purposes. Read the name under the window: "LCDR Duane Coppock USCG". Lieutenant Commander Duane Coppock of the US Coast Guard accumulated over 200 hours flying this very aircraft, #7245, when he was stationed at Quonset Point, Rhode Island in the 1960s. He's now one of our members and a very active volunteer, and conducts climb-aboard tours of his plane! The crew on the Albatross performed a ground-up restoration on this aircraft to create this wonderful example of Coast Guard aviation history. 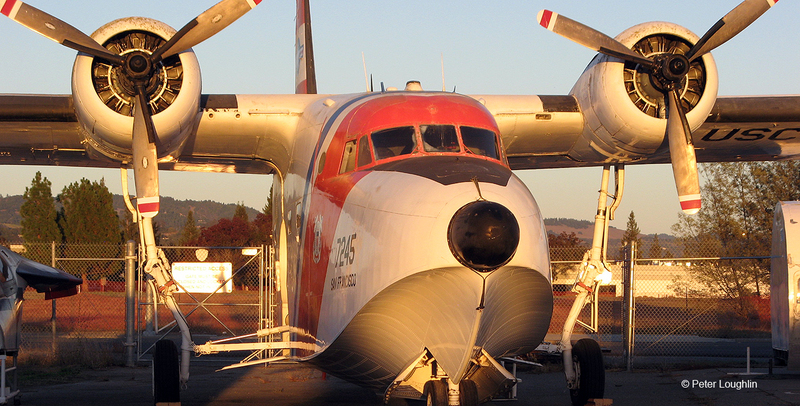 Our aircraft served in the US Coast Guard and has been faithfully restored to what it looked like during that time. 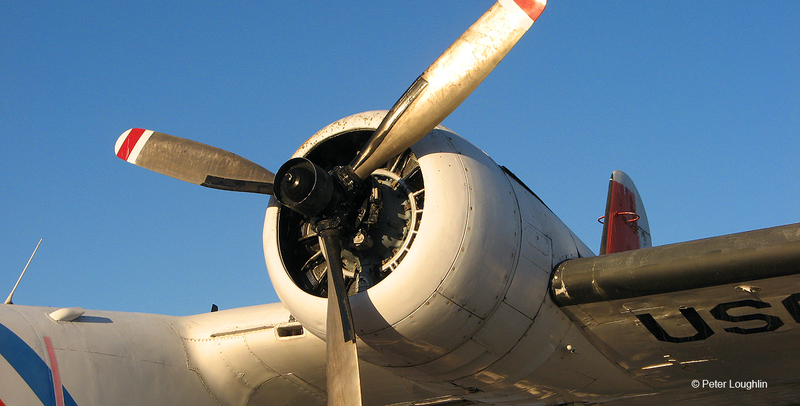 The Albatross was powered by two powerful nine-cylinder engines. 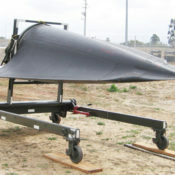 The propellers could be reversed in pitch to push backward. This allowed great maneuverability when the plane was sitting on the water, as the pilots could keep one engine in normal pitch (pulling forward) and the other in reverse pitch (pushing backward) to let the plane pivot in place. This was very valuable when rescuing downed aviators floating in the water. 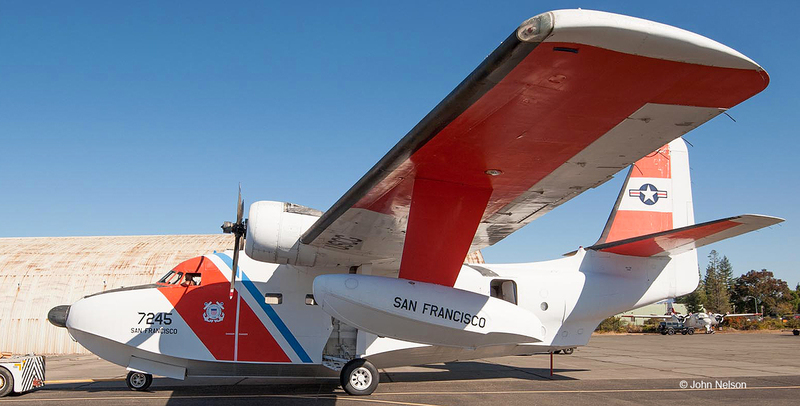 Coast Guard aircraft tend to serve many locations over their lifetime. 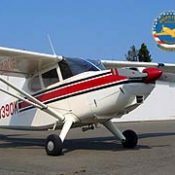 This one first flew with the Air Force, then with the Coast Guard from many stations around the country. It was released from Coast Guard service in 1980, ended up under civilian ownership, and was donated to PCAM in 1999. The Albatross is a popular climb-aboard aircraft at the Museum, and kids love it because they can sit in the cockpit surrounded by gauges, switches, levers, and other controls. Turn the control yoke and watch the ailerons move! It's one of the best educational aircraft on our lot, particularly since at least two of our volunteers flew Albatrosses during their military careers! HU-16E Albatrosses were in the U.S. Coast Guard fleet from 1951 to 1983. These aircraft were used on many types of missions. They were used as search platforms looking for lost boaters or downed aircraft and to locate sinking fishing boats. If they were needed, de-watering pumps were dropped by parachute. Crews launched day or night. The aircraft were used to check on ship collisions or to locate vessels with ill crewmen. Many times the aircraft escorted helicopters to complete rescues, and rarely this amphibian landed on water to make a rescue. At other times crews used Albatrosses to evacuate ill personnel from remote islands and other locations. Medical personnel were transported from bases to remote locations. During some night searches parachute flares were dropped. Many times on large over-ocean searches the crew would be designated On-Scene-Commander and coordinate the efforts of a large fleet of aircraft. On a few occasions, when an airliner crashed on land, the Coast Crew was designated On-Scene Commander to coordinate helicopter flights to and from the scene. On at least one occasion in Florida two Albatrosses were used on an FBI manhunt. Albatrosses were used on the International Ice Patrol and they patrolled in search of boat people from Cuba and Haiti. When boat people were spotted the crew would call in a helicopter or boat to make the rescue. If needed, survival gear and water were parachuted to the survivors. Another use of the Albatross was for fisheries patrols, checking the positions of American, Russian, and Japanese boats. In the late 1970’s, patrols were made for drug interdiction off the Miami, Florida coast and in the Caribbean. 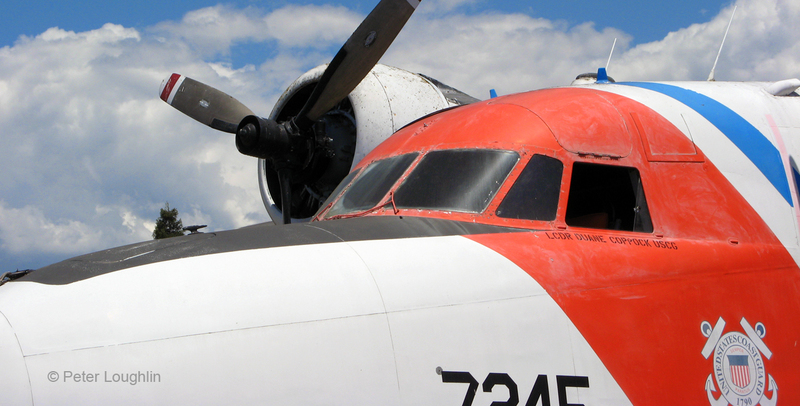 Our aircraft, HU-16E, 7245 was acquired from the U.S. Air Force in 1957-58 and was in the Coast Guard fleet until 1980. Some of its history is known. The aircraft was stationed at Coast Guard (CG) Air Station, Biloxi, MS in 1961, and then at CG Air Detachment Quonset Point, RI in 1963. Our crew chief, Duane Coppock, is a retired Coast Guard aviator and flew 7245 at those locations. 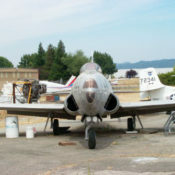 The aircraft was decommissioned from CG Air Station, Cape Cod in 1980. If you are or were a Coast Guard aviator and flew 7245 please inform our museum by contating our Operations Director at 707-575-7900 or Email: Christina Olds. or regular mail. Our Albatross, 7245, was donated to the museum in 1999 by Mr. Don Johnson of Riddle, OR. It is a unique and outstanding addition to our stable. 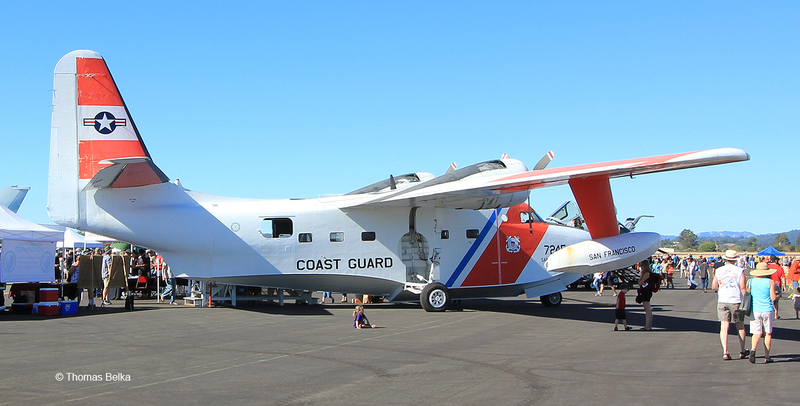 Shortly after receiving 7245 museum members repainted the aircraft in high visibility Coast Guard “International Orange” and white. It matches the late 1970s Coast Guard paint scheme and is still current today. 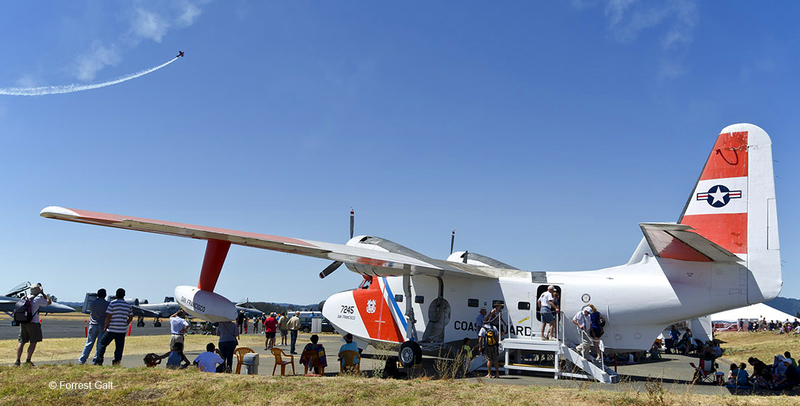 Our Grumman Albatross provides an exciting and unique historical display for adults and children alike. This “Training Classroom” provides an exceptional educational platform for school children of all ages. Tours can be arranged by calling the museum to schedule a date and time for your group. Crew: Four to six. Up to 10 passengers.